note: i edited this to add pictures at the request of a reader. they're not pictures of me - they're just pictures that i found online. no, they will not look quite the same on me as on the models. 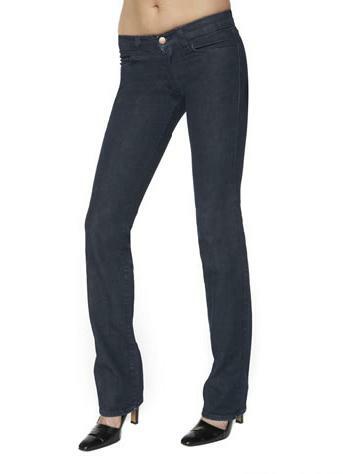 you can buy skinny-leg jeans, but you can't buy skinny legs. oh well. and (4) one pair of white "sass & bide" jeans. they're all "skinny" (i.e. pretty tight & very narrowly cut) - am i going to get sick of that style? well, i already own other styles of pants, i guess, so that style is really what my wardrobe had been lacking. the main problem now is that none of them are presently wearable - they all need to be taken up (a lot), because i have short legs, and the x-girl jeans were too big so i have to send 'em back and re-order them in a smaller size. damn internet sales. i should've known it's just asking for trouble to order anything wearable online. buying white jeans was a little bit scary for me. i was like, am i really going to wear these? what does one possibly wear with white jeans? but the kind salesladies at the store (azalea, in hayes valley) were very helpful and suggested a variety of cute t-shirts in not-too bright colors and, most importantly, with PRINTS. that was my eureka moment of the month. in solving my "what to wear with white jeans" problem, i also simultaneously solved my "what to wear with my solid-dark-black jeans" problem, and my "why is my wardrobe so boring" problem. lesson: you can't be afraid of prints. (patterns, designs.) it's no wonder i always felt like none of my boring solid-color shirts (basically my entire wardrobe) worked with my black jeans - two intense solid colors makes you look like a crayon palette. to be truly fashionable, it's not enough to wear shirts with interesting details in the fabric or unusual cuts - i think maybe as a rule of thumb you should always pair a solid with a print. so a solid shirt with a printed skirt, or if you're wearing solid-colored pants (e.g. most jeans) - a printed top. or at least maybe layer a couple of different tops (two shirts, or a shirt & jacket) so the solid colors are a little broken up. maybe belts could be part of the solution too. i must confess, i don't own a single belt. If this is crazy I don't ever want to see you sane. I like belts with white jeans. Skinny jeans are going to be old news in a year. good point. personally, i've been a longtime fan of narrow-leg jeans, but i think you're right that they've hit such a saturation point this year that they have nowhere to go but down.